No one ever wants to hear the word cancer, and facing cancer in dogs and cats is especially painful. Unfortunately, dogs and cats get many of the same cancers that humans get. Cancer is the most common cause of death in pets. We now know that cancers are caused by genetic mutations and can occur anywhere in the body. A tumor is an abnormal growth of cells and can be benign (harmless) or malignant (cancer). The location, type, and treatments available for cancer determine the seriousness of the disease. We know in dogs and cats that most cancers are hereditary and genetic, meaning that certain breeds are predisposed to get certain types of cancer, but we don’t know exactly why one purebred animal may get the predicted cancer and another does not. Dogs with mixed genetics are impossible to predict. Cats are susceptible to similar cancers as dogs but in different ways. Extensive research in humans and animals is finding out more about cancer every day. Most cancers occur in elderly dogs and cats; pediatric disease is rare. Some cancers are sneaky. You may see unexplained weight loss, fatigue, eating less or maybe the same. The rest of the pet seems normal. Other cancers are more obvious. You may find an abnormal lump, bump, raised area, non-healing wound, or discoloration that doesn’t go away on its own. Your pet could have pain, swelling, and limping on a leg. Other signs are unexplained vomiting, diarrhea, coughing, shortness of breath, increased or decreased thirst and urination. Unexplained blood, anywhere, should be of concern, as well as, enlargement of the abdomen, eye, or lymph nodes. Cancer can look just like a lot of other less serious diseases. 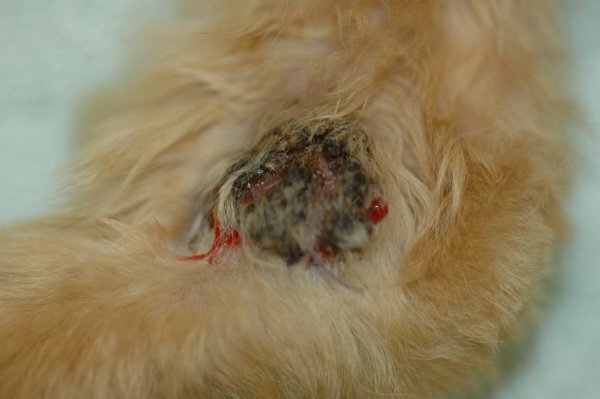 The first step may be a fine needle aspirate, or a biopsy, when your vet takes a sample of the abnormal tissue and sends it to a pathologist to see what it is. Routine blood work and xrays are needed to look for internal problems. An ultrasound can visualize internal organs so that biopsies can be done without surgery. But, some cancers can only be diagnosed with surgery, to get just a biopsy or to remove as much of the abnormal tissue as possible prior to microscopic diagnosis. The treatment of cancer in dogs verses the treatment of cat cancer can be very different. Each type of cancer has its own choices for treatment. Some can only be treated with surgery, or only with radiation, or only with drugs. Others are treated with combinations of therapy. Scientists are finding new medications to use all the time, and most drugs that are used in humans can be used in pets, if they are available. Drugs can stimulate the immune system to fight the cancer or kill the cancer cells directly. All treatments have consequences or side effects that limit the amount the pet can receive. Some cancers can be cured and others only controlled for a period of time. In general, the earlier cancer is detected, the better the outcome. Don’t just pet your dog or cat, examine them daily! Try to view or touch all parts of the body when you are up close, and watch how they move when farther away. Know what behaviors are normal for your pet. Have them examined by a veterinarian if you notice something unusual. Know which cancers are most common in your dog’s breed, if possible. Know the common cat cancers, and what signs to look for. Remember that some pets instinctively hide their symptoms, and of course, all that fur makes it hard to see anything! Regular check-ups with the vet are very important. We discuss the individual types of cancers of dogs and cats in separate articles.